Debut author Mary Helen Moore Neuendorffer’s book to be featured in this year’s London Book Fair compels readers with a beautiful tapestry made with rich culture and history. A poignant fictional tale, this story showcases the recurring interaction between the permanent town people of the beloved small New England town of Northfield, Massachusetts and their often troublesome excursionists. 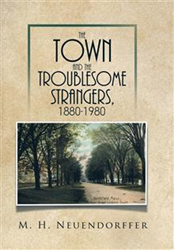 Chronicling the interesting events that took place in a span of a hundred years, “The Town and the Troublesome Strangers, 1880-1980” (published by Xlibris) pictures how the old community approached the case of the young globetrotters. The enjoyed balance and harmony of the warm community of Northfield has been disrupted when newcomers started moving into the humble village. Some were attending summer conferences; some were German sympathizers during WWII and the 10-year-old commune that was set up by hippies. Trying to keep the peace, abundance and serenity of the age-old traditions kept by the locals, the wise and impressive characters of the town must find the exact and fit arrangement in dealing with the intruders. This light-hearted adventure features varied and equally delightful characters, namely: James Crawford, a Northfield farmer who optimizes the hard working people of the town; John Peterson, the owner of a detective agency, who is suspicious of German sympathizers in Northfield during WWII: and, Joan Brownell, a longtime member of the commune that was forced to leave. With this publication, the author Neuendorffer endeavors to highlight the puzzle of human nature compared to the pleasantness of natural scenery. Mary Helen Moore Neuendorffer was born in Philadelphia. For over 100 years, starting in 1880, her family went to Northfield, Massachusetts, in the spring, summer and fall. She attended Mt. Holyoke College and the Connecticut College for women, where her course included English literature and creative writing. After she married, the family lived in Stonington, Connecticut; Lloyd Harbor, Long Island, New York; and also lived in Europe for three years, two in Paris, France, and one year in Brussels, Belgium. Her book, “The Town and the Troublesome Strangers, 1880-1980,” is her first completed historical novel. She now lives in Gladwyne.